Two years of grooming. 6in x 12in coated panels groomed weekly (top) compared to panels left ungroomed (bottom). Autonomous hull grooming robot user interface. Greensea Systems, Inc., a software ated Vehicles (ROVs). These OPENSEA vehicle-agnostic tractor skid inclusive of stacles and obstructions, and log all data company specializing in advanced navi- software modules provide the tools and the navigation and control systems, au- for archival and replay. 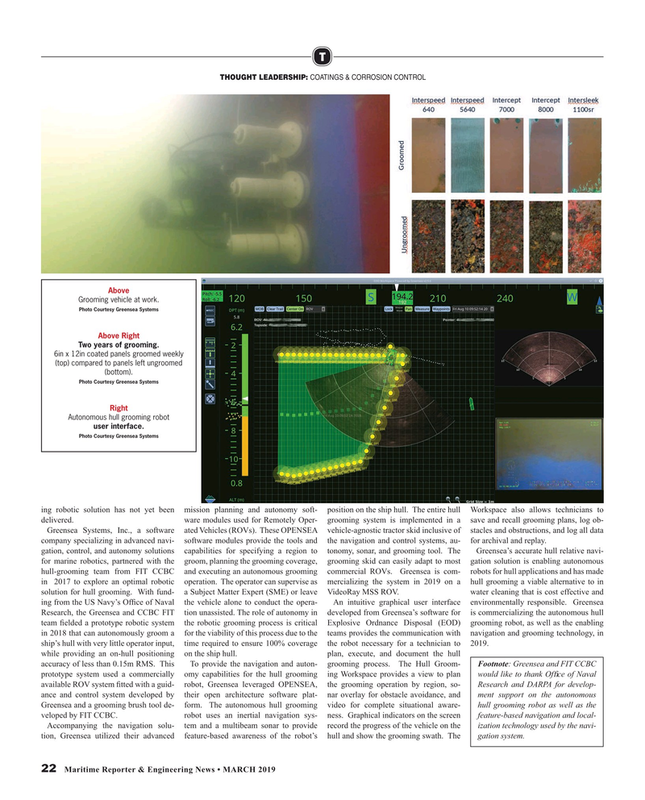 Accompanying the navigation solu- tem and a multibeam sonar to provide record the progress of the vehicle on the ization technology used by the navi- tion, Greensea utilized their advanced feature-based awareness of the robot’s hull and show the grooming swath. The gation system.